The number of people with opioid use disorder (OUD)—which is marked by a dependence on opioids, including prescription pain relievers and illicit drugs such as heroin—far exceeds the treatment capacity across the country. In 2017, more than 450,000 individuals with OUD were unable to access treatment. Increasingly, states and local communities are implementing models that aim to improve the availability and effectiveness of OUD treatment. This issue brief describes four innovative treatment models that show promise in improving patient outcomes and that have been or will soon be replicated in other jurisdictions. The treatment models described do not represent an exhaustive list of approaches but instead serve as examples of programs that states and communities have successfully implemented. All of them offer medication-assisted treatment (MAT)—which combines drugs approved by the Food and Drug Administration (FDA) with behavioral interventions—and focus on care coordination for individuals with OUD. In 2013, Vermont implemented the Care Alliance for Opioid Addiction, a statewide treatment response to the opioid crisis that integrates care across primary, acute, and behavioral health settings (see Figure 1). 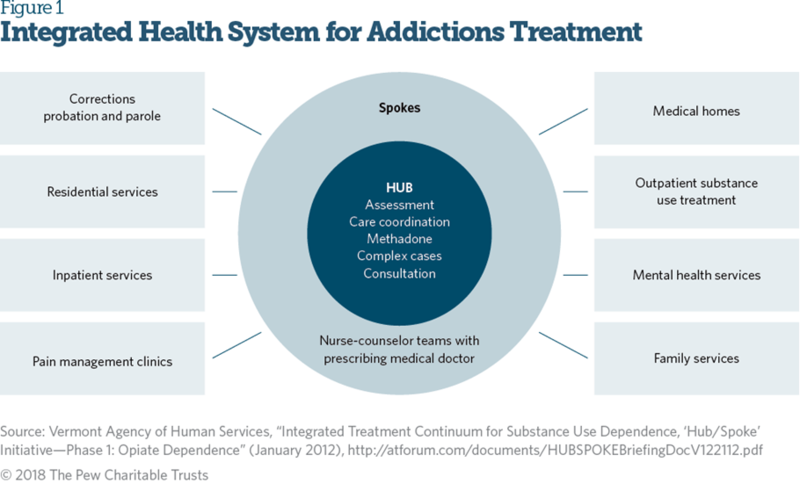 Recognizing the important role of MAT, this model expands access to FDA-approved drugs and related counseling services by creating two interrelated systems of care called hubs and spokes. Specialists initiate treatment at a hub, and care is then transferred to a community-based provider, or spoke, once the patient is stabilized (e.g., when cravings are diminished and misuse is greatly reduced or discontinued). Vermont’s hubs are specialty treatment centers located across the state and regulated by the federal Substance Abuse and mental Health Services Administration as opioid treatment programs (OTPs). These sites are the only licensed providers of both methadone and buprenorphine. Hubs initiate treatment, stabilize patients, and provide ongoing subject matter expertise and consultation to the community-based providers functioning as spokes. Vermont’s spokes are community-based prescribers who provide office-based opioid treatment and work in tandem with multidisciplinary staff, such as nurses and clinical case managers. These health care professionals connect patients with wraparound services that support recovery by addressing nontreatment needs such as housing and transportation.4 Additionally, spoke teams coordinate the individual needs of each patient and provide counseling and case management services. Nationwide, most office-based opioid treatment (OBOT) physicians treat only a small number of patients because of challenges with induction (the medically monitored startup of buprenorphine treatment), lack of support for providers managing complex patients, and lack of psychosocial services for patients. In the hub-and-spoke model, specialized clinics induct patients onto buprenorphine or naltrexone before they transfer to OBOT; consult with hubs on referrals and screenings; and provide treatment for more complex patients. Each spoke is supported by a MAT team that provides additional clinical support to OBOT physicians, including coordinating counseling services. Vermont uses Medicaid dollars to fund the comprehensive care coordination used in the hub-and-spoke model. Using the same funding mechanism, two other states—Maryland and Rhode Island—have implemented similar systems of care for individuals with OUD. Three years after hub-and-spoke was implemented in Vermont, the number of physicians able to prescribe buprenorphine for OUD had increased by 64 percent. Months before implementation, only 650 patients were receiving methadone treatment in OTPs and 1,700 were receiving buprenorphine in OBOTs; by September 2016, OTPs, or hubs, were serving 3,147 patients, and 3,457 patients were receiving buprenorphine at OBOTs, or spokes. 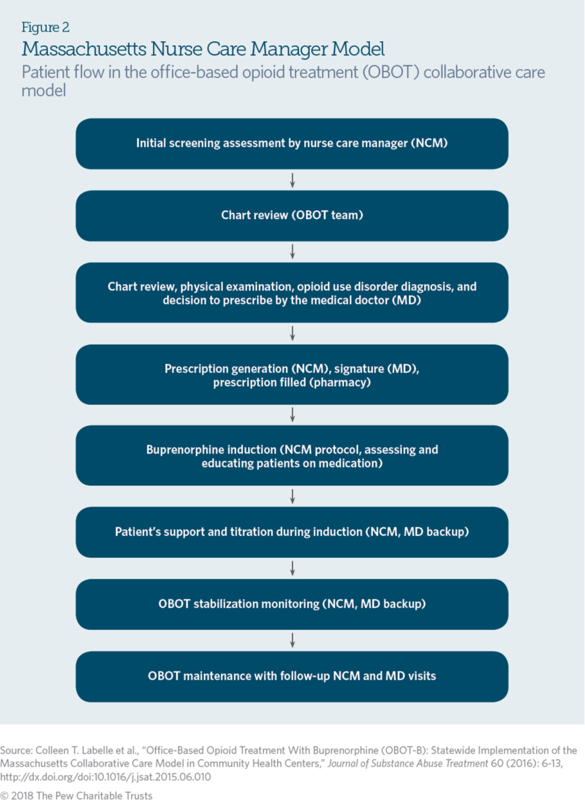 Another approach to expand the number of patients treated in OBOT settings, use of nurse care managers (NCMs) to deliver MAT in community health centers, was pioneered by Massachusetts. This model addressed many of the barriers to prescribing more buprenorphine that providers had described, including lack of time, limited clinical supports, and insufficient nursing support. The NCM collaborative care model was implemented in 2007 with initial funding provided by the state; the program transitioned to a model in which practices bill Medicaid for services. It allows physicians to treat a large number of patients with clinical support from NCMs who have completed a training program. The NCM conducts an initial screening of patients, including documentation of substance use, treatment history, and medical and psychiatric history; the physician confirms the patient’s diagnosis and the appropriateness of buprenorphine treatment; and the patient schedules an appointment with the NCM for medication induction (see Figure 2). At the induction appointment, the NCM—under the orders of a supervising physician—assesses the patient for withdrawal symptoms, provides the first dose of buprenorphine, and serves as the patient’s primary point of contact. Patients are initially required to see an NCM weekly for urine drug screening and verification of participation in behavioral health counseling (provided at the community health center or a nearby clinic), although frequency of visits may increase or decrease depending on patient needs. NCMs educate patients, respond to other needs (e.g., housing and employment), develop treatment plans, oversee medication management, document treatment adherence, and communicate patient information with the prescribing physicians, counselors, and pharmacists via the electronic medical record. OBOT physicians review and supplement NCM assessments, perform physical examinations, prescribe buprenorphine, and follow up with patients at least every six months. After implementation of the NCM model, access to OUD treatment substantially increased: From 2007 to 2014, the number of patients accessing buprenorphine grew from 327 to 3,000. Additionally, the number of physicians prescribing buprenorphine in participating community health centers rose to 114 in 2012, up from 24 in 2007. This collaborative care model addresses many of the barriers that prevent physicians from prescribing to more patients and has demonstrated success in patient initiation, stabilization, and maintenance of buprenorphine. Using electronic information and telecommunication technologies (e.g., videoconferencing and streaming media) to promote long-distance training of health care providers can be an effective way to build treatment capacity in rural communities. Project ECHO (Extension for Community Healthcare Outcomes), developed at the University of New Mexico Health Sciences Center, uses telehealth technology to connect providers, particularly those in rural and underserved areas, with specialists located elsewhere. It offers training and support in a variety of areas including addiction medicine and allows local providers to consult with specialists on complex cases to ensure that patients get the care they need. The model has some similarity to the hub-and-spoke model in that it connects specialists located in an academic medical center or another specialty facility (hub) with community-based providers (spokes) to deliver case-based learning and mentorship. For rural communities, engaging primary care and community-based providers in Project ECHO or other telehealth strategies is an opportunity to expand much-needed access to effective treatment for OUD. In New Mexico, the TeleECHO clinic uses telecommunication to teach and recruit primary care teams located elsewhere to treat substance use disorders, thereby expanding patient access to physicians for the treatment of OUD. A two-hour learning session is offered weekly for community-based providers at no cost, with continuing education credits available. At the beginning of the project in 2006, only 36 physicians in the state had obtained the special license required by the Drug Enforcement Administration to prescribe buprenorphine. By 2016, 375 New Mexico physicians had obtained this license after Project ECHO trainings. Funding is provided by the state, private foundations, and the federal government.16 Project ECHO also has partners in 70 locations across the country that have used the model to improve various types of medical treatment, including three specifically focused on OUD. Telemedicine is the use of electronic information and communication technologies for the delivery of health care services to patients who are distant from providers. Among patients who believe they need substance use disorder treatment but do not receive it, 7.5 percent cite lack of transportation, distance to treatment, or inconvenient hours as the reason. Telepsychiatry, or the delivery of psychiatric and behavioral health care via telemedicine, can effectively increase patient access to providers without compromising quality of care. Some states are beginning to use telepsychiatry as a means of delivering MAT to patients, particularly those in rural communities. In 2010, the Hannibal Council on Alcohol and Drug Abuse (HCADA), a treatment clinic in rural Missouri, had only one doctor licensed to prescribe buprenorphine, and no clinicians able to provide accompanying behavioral health therapies. To address the lack of treatment infrastructure, HCADA in 2013 began delivering MAT in partnership with CenterPointe hospital—located in the St. Louis area, over 100 miles from Hannibal—and a company that provides secure telepsychiatry technology. Through this model, patients with OUD are prescribed medications and receive behavioral health therapy via a secure, cloud-based electronic interface. The patient visits HCADA and receives care from a psychiatrist via videoconference. The psychiatrist prescribes OUD treatment medications, which can be filled by a pharmacist or administered by a nurse, who also ensures care coordination. HCADA bills Medicaid and then pays the off-site psychiatrist for services monthly. In the first year of implementation, retention rates were comparable among those receiving telehealth versus in-person care; approximately 63 percent of telehealth patients remained in treatment after three months, compared with the in-person treatment retention rates of 50 to 72 percent reported in the literature. Further evaluation of HCADA’s telepsychiatry model is ongoing. The West Virginia University Chestnut Ridge Center uses a similar model, Comprehensive Opioid Addiction Treatment, to provide OUD treatment in person and through telepsychiatry. This model allows patients living in two rural counties in southern West Virginia, hundreds of miles from the center, to access medication to treat their OUD. Patients participate in group-based medication management sessions in which buprenorphine is prescribed through videoconferencing and receive in-person group behavioral therapy and random urine drug screenings at two local community mental health facilities. Retrospective analysis of this model found that outcomes—such as treatment retention and abstinence from drug use, as assessed by urine drug testing— were comparable when OUD treatment was delivered via telemedicine or provided in a doctor’s office or treatment facility. The federal government, states, and local communities are seeking solutions to address the public crisis caused by the rise in OUD. Innovative models such as the examples cited here prioritize care coordination and collaboration to ensure that patients have access to safe, appropriate, and effective treatment that includes medications and counseling. Such treatment, paired with supports such as housing, transportation, and employment, can help patients achieve long-term recovery. States and communities should consider promising treatment models in the context of their own systems and adapt the models to achieve improved access to care for their communities.